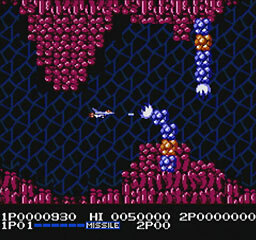 Life Force is a space shooter that was originally released in the Arcades in 1986 as Salamander. There's a total of six levels split evenly between horizontal and vertically scrolling stages. The B button fires your weapon while A selects power-ups including missiles, lasers and force fields. To use these special weapons you must collect red power pods that are dropped by destroyed enemies. Each one you gather moves a metre on the bottom left of the screen and when it corresponds to the power-up you want you can choose to activate it. It's a simple but effective mechanic and adds a nice layer of strategy. Stage 1 is a side scroller (SS) and a great opening level where parts of the scenery morph around you. Stage 2 changes to a vertical shooter (VS) but there's tons of slowdown especially when the volcanic rocks appear. It quickly speeds back up once you've destroyed a few enemies which can leave you vulnerable. In Stage 3 (SS) you need to watch out for huge bursts of fire that arch around the top and bottom of the screen. Stage 4 (VS) has sections where the speed increases and you must quickly manoeuvre your ship through tight quarters. Stage 5 (SS) starts off in a typical space setting but later on you suddenly enter a temple with narrow corridors. The final stage (VS) throws many enemy types at you in quick succession including stone heads that shoot groups of large projectiles. Each stage features a boss fight and they're all fun and require different strategies to defeat. Overall, it's a tough game and many parts need memorisation rather than reactions; however, while it's challenging it's never cheap. Life Force isn't as deep as some other NES shooters like Gun Nac (1991) but it's polished and each level is enjoyable to play. The adventure doesn't last long and there are a few problems with slowdown but it never resorts to 'bullet hell' gameplay and has a good power-up mechanic that doesn't punish you too harshly if you lose a life. Random trivia: The game was ported to a number of other systems including the Amstrad CPC, MSX, PC Engine and even the iPhone and PSP.